Welcome to the Boise Guest House! 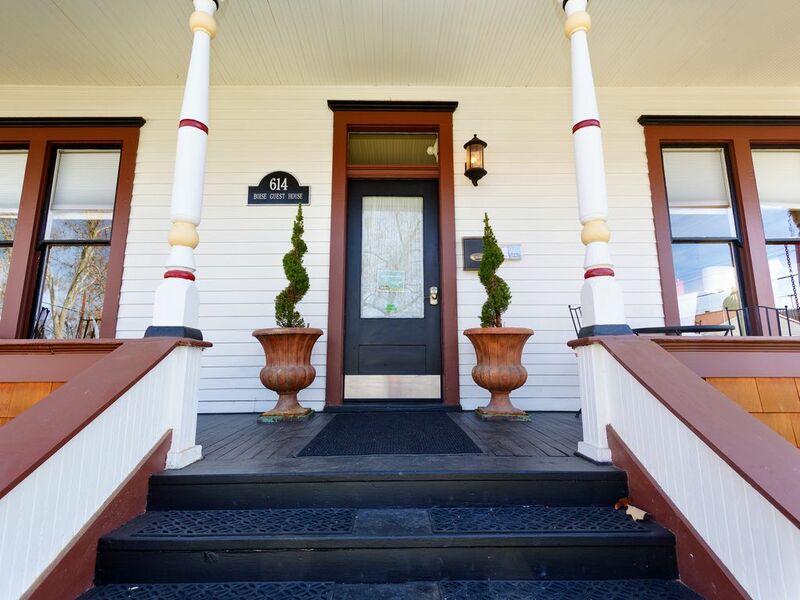 We offer 10 suites at 3 locations in historic homes in downtown Boise. Find us directly for the best rates and most updated availability. Featured here on VRBO is our Treetop Suite, a studio uniquely appointed down to every detail. Cruiser bikes are available to our guests for $10 / day. Boise is a great city to explore by bike! We are located just four miles from the airport. If you bring a car, we have seven private parking spaces along our alley fence. I hope you will consider staying with us! Keywords: Boutique lodging: furnished suites Full kitchens and private bathrooms make each suite your 'home away from home'. "The way you do one thing is the way you do everything." I take special pride in the details of Boise Guest House's suites. I love people and learning about their reasons for coming Boise, Idaho. I've created a North End experience for you, complete with bikes to rent and explore the downtown area. I have lived here for 17 years, and have three great locations and 11 vacation rental suites in downtown Boise. My philosophy for hosting is more "hands-off" by design from experiences that I have had in the hospitality industry, so please feel free to reach out to me if you'd like to meet while staying with us. My intention is that your visit to Boise is about you, and your interests. When I'm not working, I enjoy the mountains: skiing, snowboarding, hiking, camping. I cannot go a day in the summer without jumping in the nearby Idaho waters: swimming , surfing and wakeboarding are some of my favorite summer activities. Ask me and I may reveal my favorite watering holes. I enjoy Ashtanga yoga, TM meditation and Ayurvedic cooking. I love to travel to metropolitan areas as well as remote mountain wilderness. In my previous life I was a full time artist. I enjoy music, art and independent movies. I was lucky to go the the Venice Biennale in 2013 and Amsterdam to look at artist residencies for a model to bring to Boise. I have been to Burning Man five times now. I keep going back because it fills me up with ideas about temporary living spaces and the sense of community and a playfulness towards everyday life. Aside from that I am a soccer mom and we have a dog named Izzy (hypoallergenic) and two guinea pigs. We are living the North End dream. Enjoy your day! Thanks for visiting the Boise Guest House suites! I hope you will stay with us! My family purchased this historic gem of a property in 2008 and we completely remodeled the interior. It's a 120 year old Queen Anne Victorian on the outside, but contemporary on the inside with unique appointments and thoughtful use of space. We put so much love and attention into the feeling of this building. I love architecture , design and creating spaces for others to enjoy. Each suite has a private bathroom and kitchen. Instead of a classic bed and breakfast, you have your personal space with the option to enjoy the shared backyard during the nice weather. The backyard offers a quiet refuge with a barbecue, fountain and a beautiful garden to escape the city life. Our location is ideal for everyone desiring a downtown experience. We now have eight rental bikes available to explore the area to our guests. We suggest visiting the farmer's market on Saturdays, Camel's Back Park in Hyde Park or strolling down the Greenbelt river trail. If you are a runner, mountain biker or hiker, you may enjoy the nearby Ridges to Rivers trail system in the foothills. Boise Guest House is within blocks of our local coffee shops, shops and restaurants in BoDo (Boise Downtown district). The Boise Co-op, a gourmet grocery store only 3 blocks away. We are very close to three hospitals, the US Federal Building and the Legislative Offices (and renovating State Capital) so business travelers enjoy our proximity as well. All bathrooms have a shower except for the Nature Suite, which has a clawfoot tub. Washer and dryer laundry room on site for guests use. Breakfast bar seats two. Large coffee table serves as an eating area. Chairs and tables on balcony can be brought inside for a dining area. All suites have iphone compatible alarm clocks. A small library is provided in almost every suite. Toys are provided upon request. Communal backyard with chairs, table, fountain, landscaping, grass, trees and a Barbecue. Idaho River Sports is a local paddleboard and kayak lesson venue. Bicycle rentals available upon request. Lovely outdoor deck with table and chairs. Flower beds and view of state capitol. Please ask owner for more info! Bogus Basin is 1/2 hour drive from Boise Guest House. Rentals are available within a mile of our facility. This is a completely restored historic home converted into six unique apartments. Charm, convenience and boutique appointments. I lived in Boise for eight years and always wanted an excuse to stay here. Since I've moved away, I now have that excuse. I booked the Story Suite for a weekend in December and was a little disappointed when the host asked the week before my visit whether I'd stay in the Animal Trophy Suite instead since another party wanted to book the Story Suite for a longer stay. However, I enjoyed the Animal Trophy Suite's whimsy and comfortable quarters -- a great retreat for one or two people. The bed was comfy, the kitchenette well furnished, and the location (close to downtown Boise and the North End) is hard to beat. I'm tidy and appreciate that this is one property that does NOT charge an extra cleaning fee, at least for a short stay. I also would have preferred better light-blocking shades ... even in winter, this was not an especially dark room for sleeping. But all quibbles aside, I enjoyed the Boise Guest House and I will be back. Amazing stay. It's everything you want it to be. Everything has been thought of to make your stay pleasant. They think of all of the details on things and a way to make it nicer than anywhere I've been. I don't want to give away some of the excellent things we found on arrival but they certainly thought out how to make someone feel great when staying at Boise Guest House. There is free parking which was helpful. The rooms and design were terrific. It was all smiles and comfort. Even the back yard common area was thought out and a peaceful place to sit and have morning coffee. You can walk to the downtown area, to parks, and to hiking. We will definitely be back when visiting family and have already told family they must stay here. It's going to be hard for anyone to compete. The Guest House is lovely. So cute! We stayed in the Attic Room, and it was just right for the two of us. The coffee provided was delicious! The house is in a great location- we were able to walk to a lot of restuarants downtown. We enjoyed Bardenay, Flatbread, and Cafe de Paris among others. I will say that the kitchen was very small so I'm glad I hadn't planned on doing any major cooking. Also, if you are expecting a full service hotel thing, this is a different experience. It is very much a hands-off kind of thing. You check yourself in. No housekeeping coming in everyday. If you want something, you call to get it. We were fine with that. If you aren't...well, now you know. Anyway, thanks for a great time Boise Guest House! Loved our stay...10,000 times better than staying in a hotel!! Beautiful house, stylish decor, so many artistic and clever touches. Felt like being at a friend's home, only better. Amazing location just blocks from the Boise Co-op and the downtown hub. Easy (and free!) parking just steps from our door. Eve responded immediately to all our questions and needs. Have already been recommending it to friends. We definitely will come again! Cute, Clean, Convenient to Downtown! We stayed three nights at the Boise Guest House and found it to be super clean, very nicely decorated, and a pleasant place to stay. Convenient parking and great location. Walked downtown for dinner and just to walk. Pretty area near Capitol building, park, Flying M coffee shop (yum). Eve-Marie was very responsive, both to phone and email. If our son picks Boise State, we will be back! Rates are subject to availability and confirmation. Our calendar may not reflect true availability as we have 11 suites and may have more options for you.